When I first got this I used the photo on a Blog post, must have been 4 years back, at the time I was also involved in the trade/sale of a second nicer one, crazy how when it rains it pours! 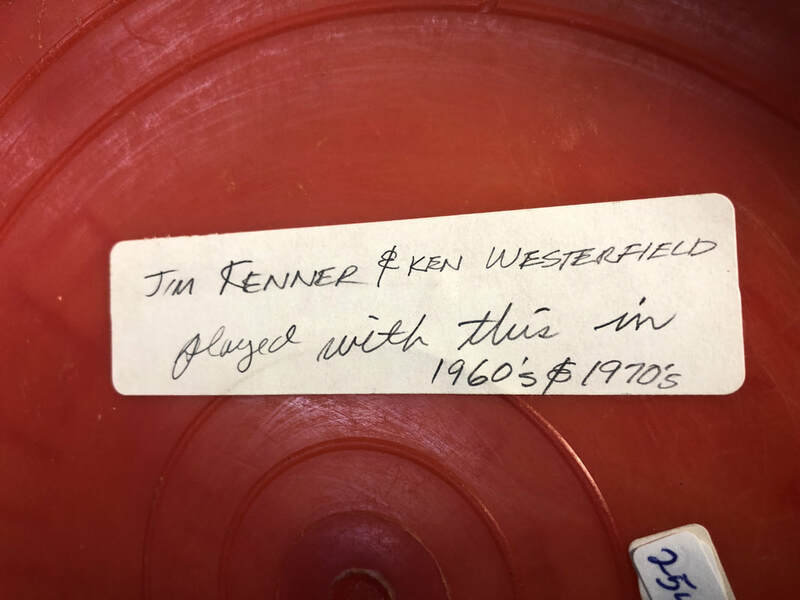 I think Kirkland got the nicer one!, This is on a WPP1, why do you ask, well when Fred started his deal with Wham-o he got discs from them & he had extra stickers so here you go, could be fewer labels than AT discs. American Trends sticker, does not get any better that this! Super clean, from the collection of Phil Kennedy. 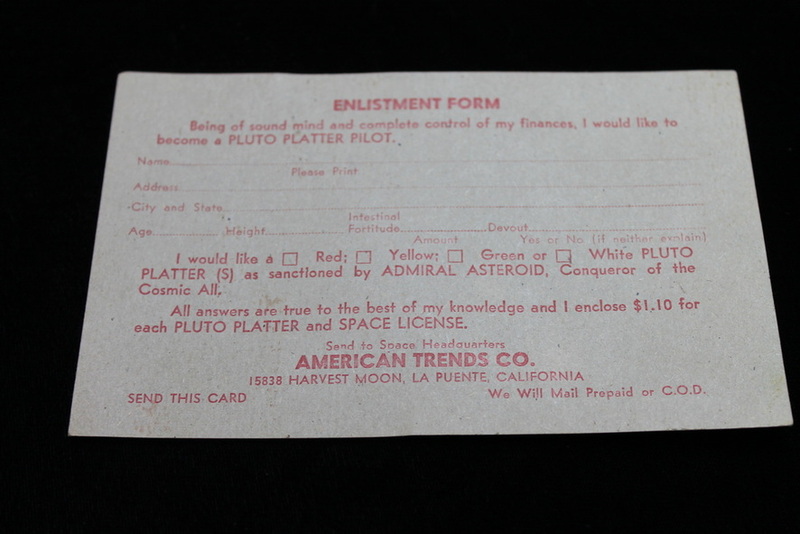 Only 3 of these in the package American Trends Pluto Platters are known to exist, they were each close to 10K, bringing the highest dollar amount paid for any flying discs! From the collection of Phil Kennedy. 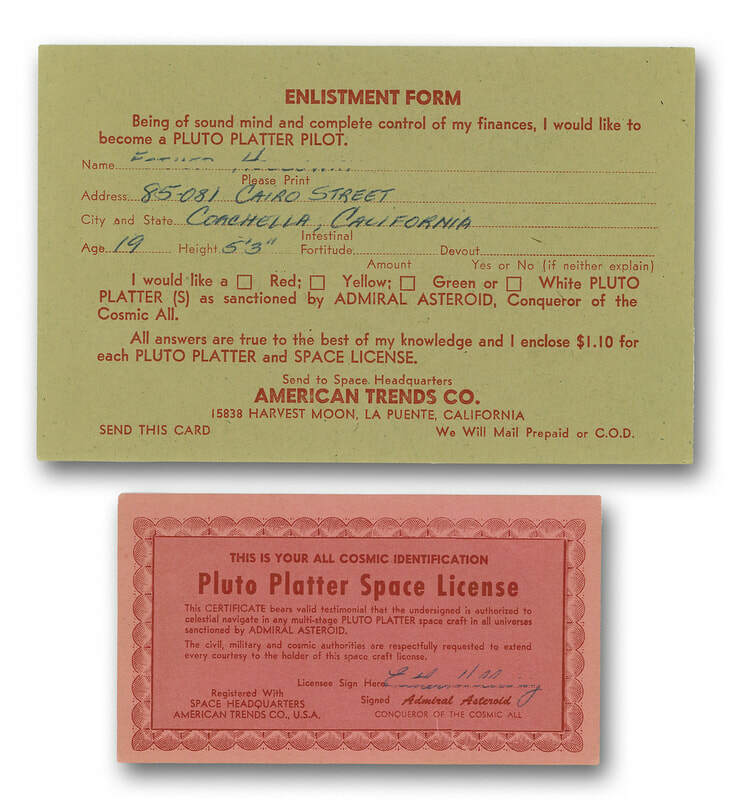 I have 2 Enlistment forms, here you also see the Pluto Platter Space License, these came in the bag with the disc, Both from the collection of Phil Kennedy. 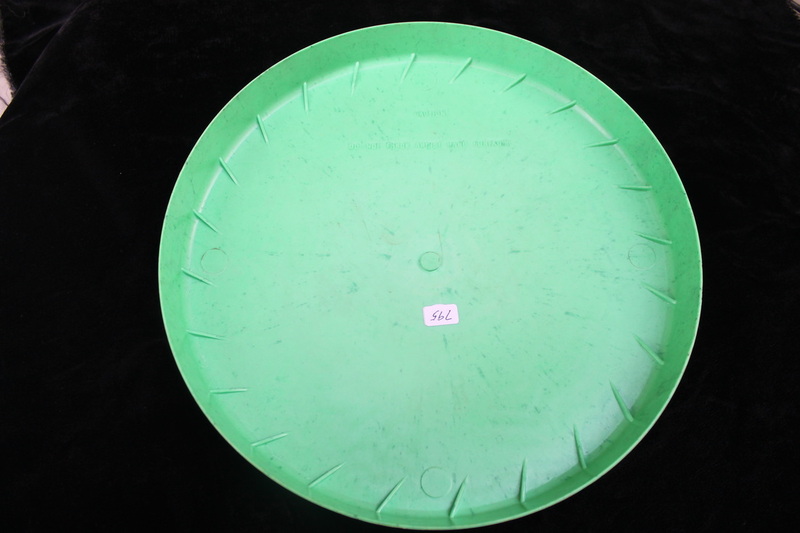 I won this American Trends Pluto Platter on e bay a few days ago, ( 2013 ) that makes 3! 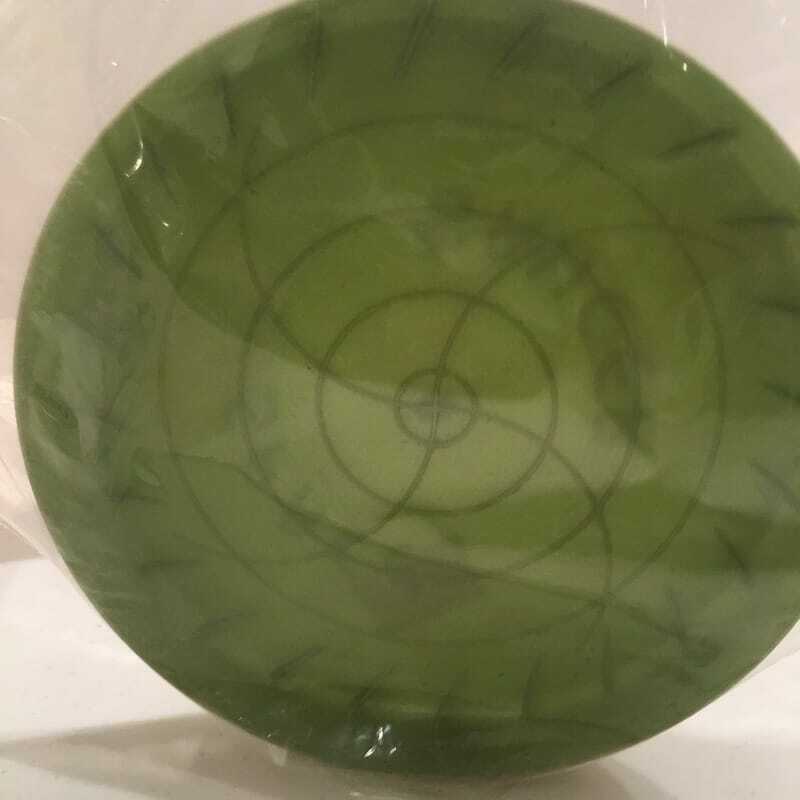 I paid twice what I have paid for the next highest disc,in my collection, $1,600.00. 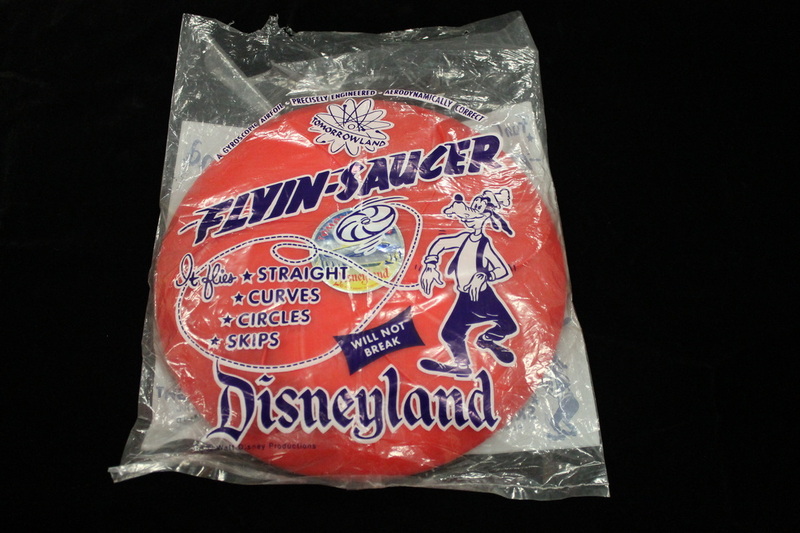 so few of these discs around I value it at $2,500. Gave her a little cleaning. this one is the best condition of the 3 I have! this one has seen some play, it displays from the top much better, WALL HANGER! 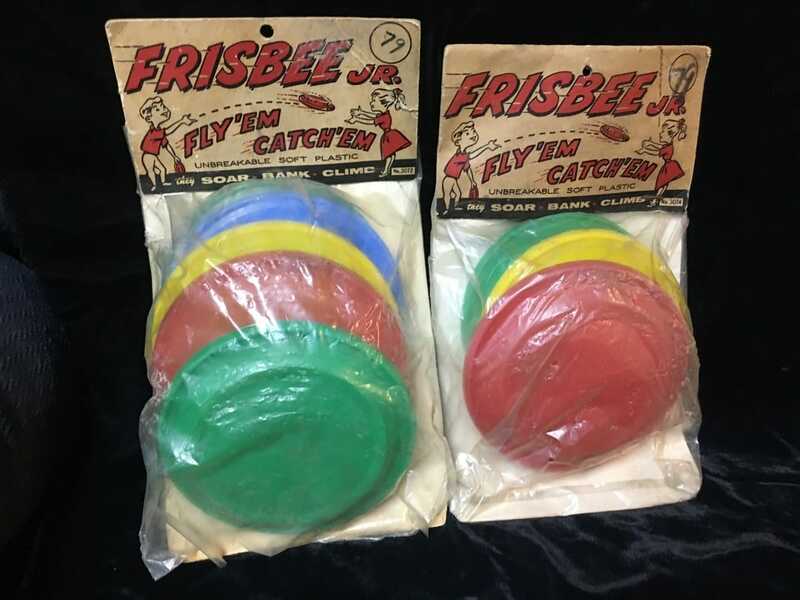 It is a tossup, this one has more play that my other red, but the other has a faded top & what I will call a dog kiss, 3 marks from a dog that are very lite, that you can see below. Unknown manufacturer FS 13. 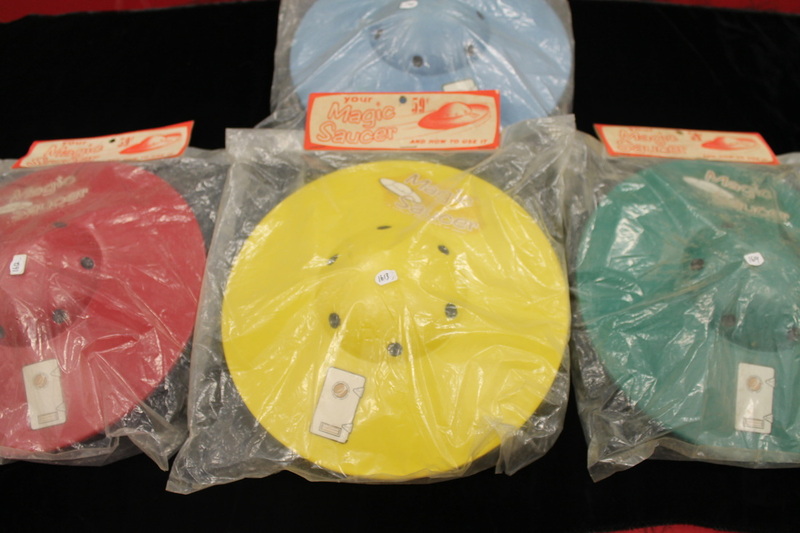 Retooling from the very first plastic disc, value $180 each. 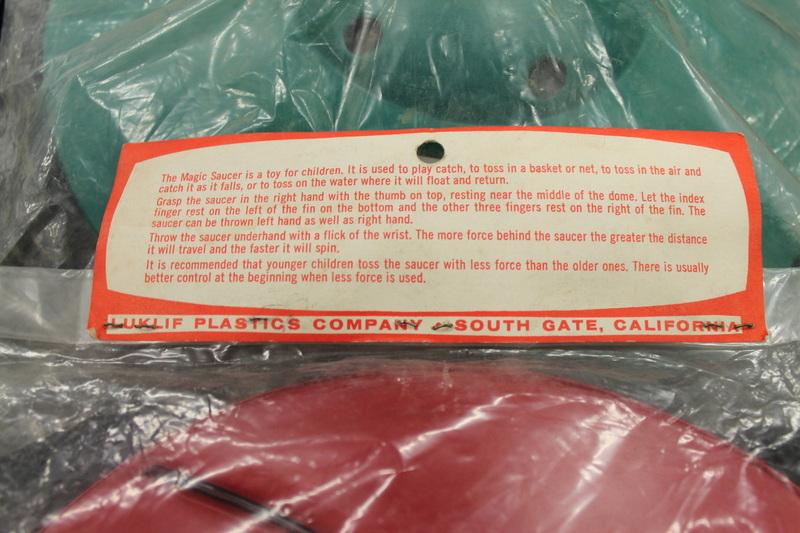 So-Cal Plastics FS7, note the cardboard and metal hanger hole. got 2 of them now! Value $800 each. So-Cal Plastics FS 7D and FS 8D. 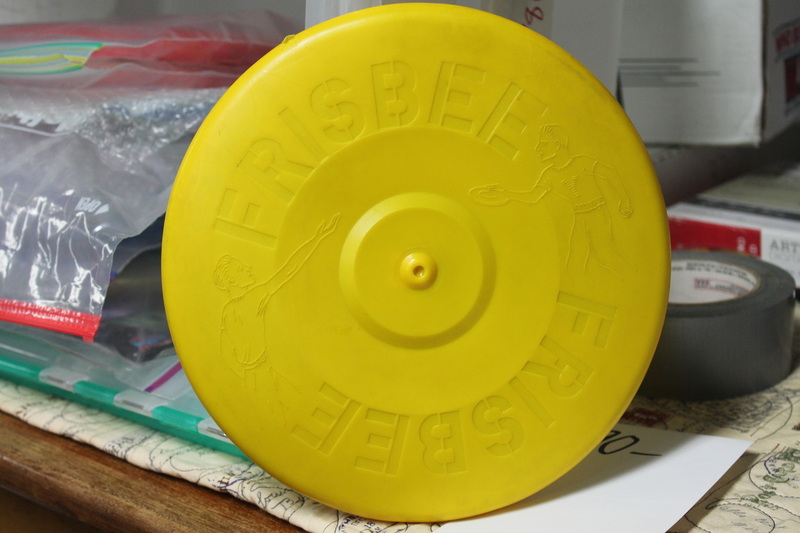 because of the condition of the bags discs are all E+ condition, the value on the blue is $500, yellow $550 & red $650. So-Cal Plastics FS 8D....super clean! 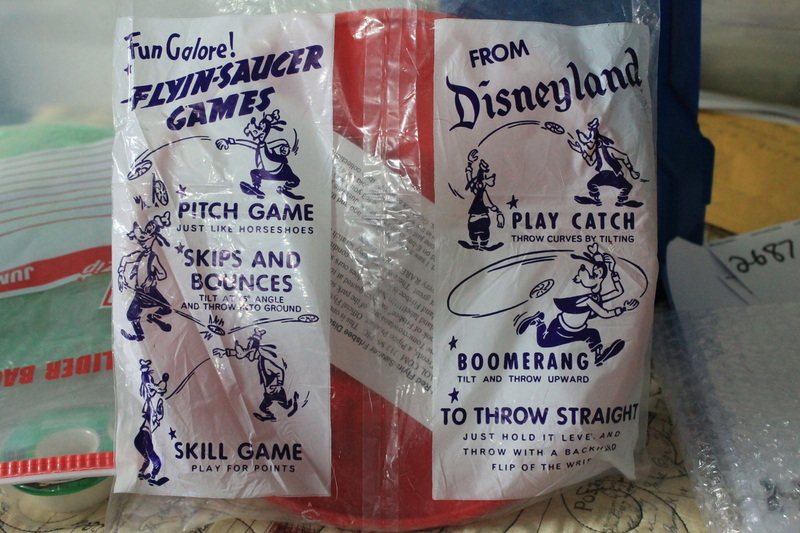 Backside of the Disney Bag. Southern California Plastics FS 7 is the gun metal blue it has seen some action, value $225 & the hard to find FS 8 has not been used, value $500. 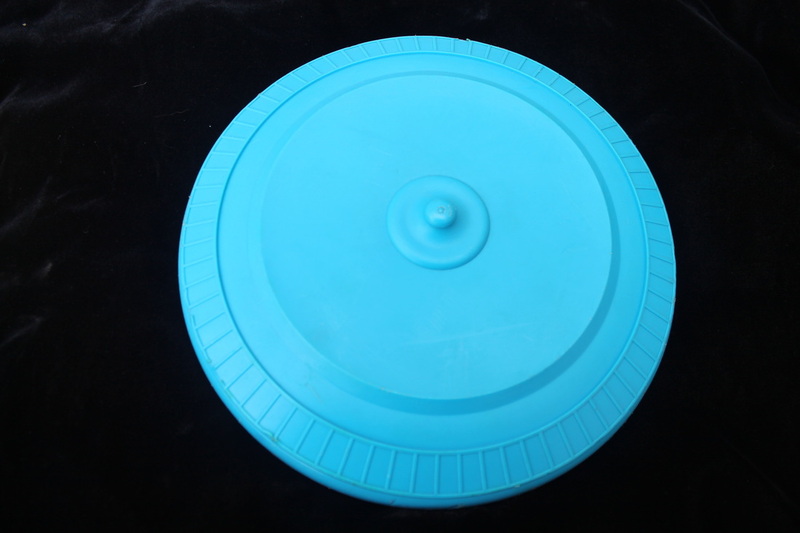 A better look of the center of the above disc. Southern California Plastics FS 10. Value $225. Royal Krafts International FS 11. Value $250 each. Royal Krafts International FS11. Value $250. Southern California Plastics FS 10. Seen some action, value $200. Southern California Plastics, FS 10. 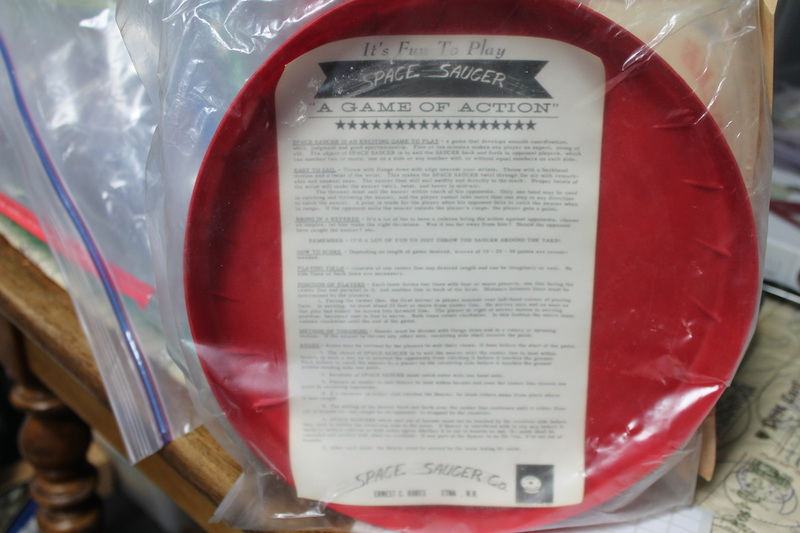 S.P.co Buck Rogers Flying Saucer, Two inverted paper plates, styrofoam type core, metal ring, 1950s. Value $600. Remco Catch It ( circa 1967 ) Star Trek-USS Enterprise-Bust of Dr. Spock. Has a cross over appeal, used condition but label on very good condition, Value $75. From the people that brought you the pocket fisherman! 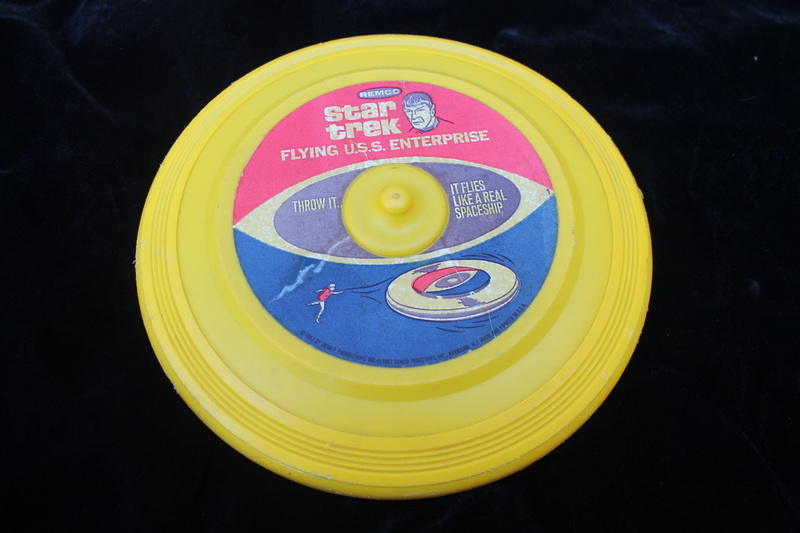 Remco Catch It, note the rim is different from the disc above, could be a later year. 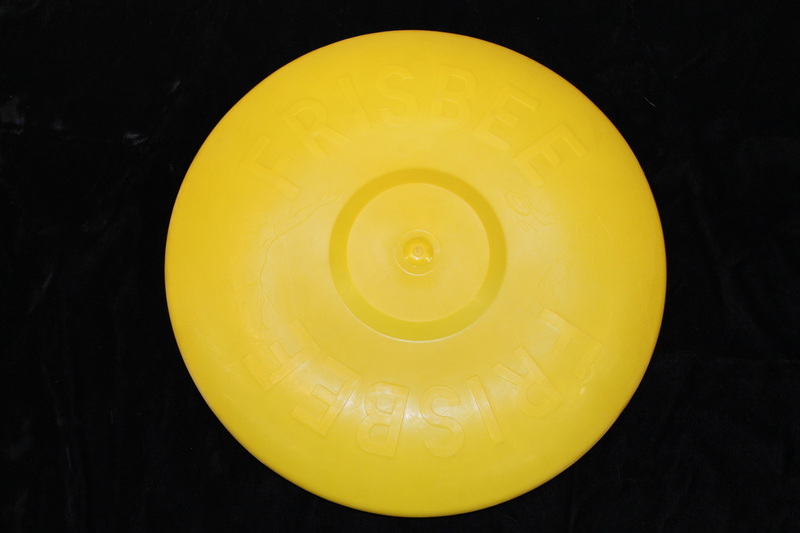 Premier Products Mars Platter 3rd style the addition of the word Frisbee on the underside, below you can see a nice 1st style green and a 2nd style yellow in the package, ( near the bottom ). Poor condition 3rd run, dog bit & wellished, ( plastic peeling apart ) I still give it a $45 value. PP 3rd style. 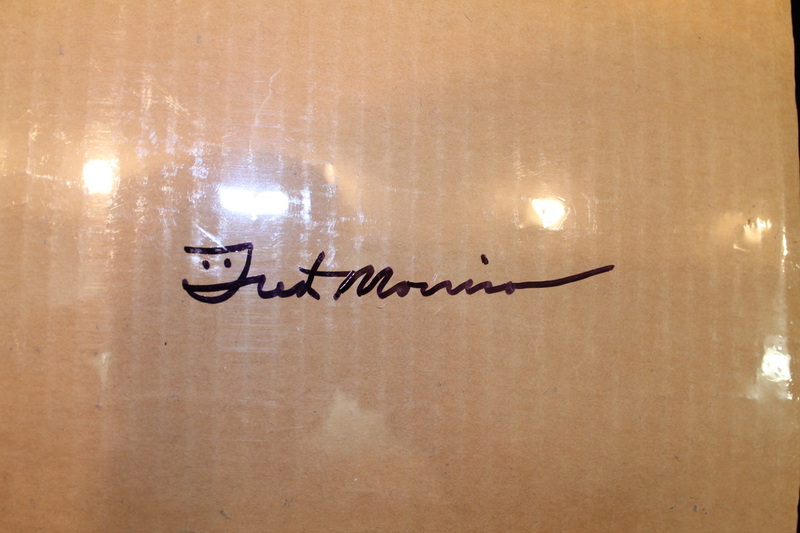 This 3rd run is in good condition but has some ink, value $110. Premiere Products 2nd style planets in order. 2nd run Good + condition value $160. Premier Products Mars Platter 2nd style no esker. 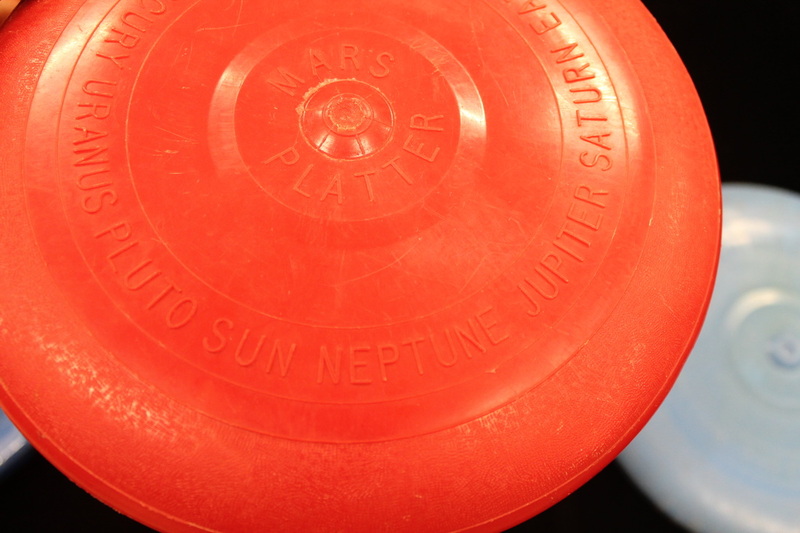 Premier Products Mars Platter 1st style planets out of order. Excellent condition value at $200, in New condition like my green value would be $300. 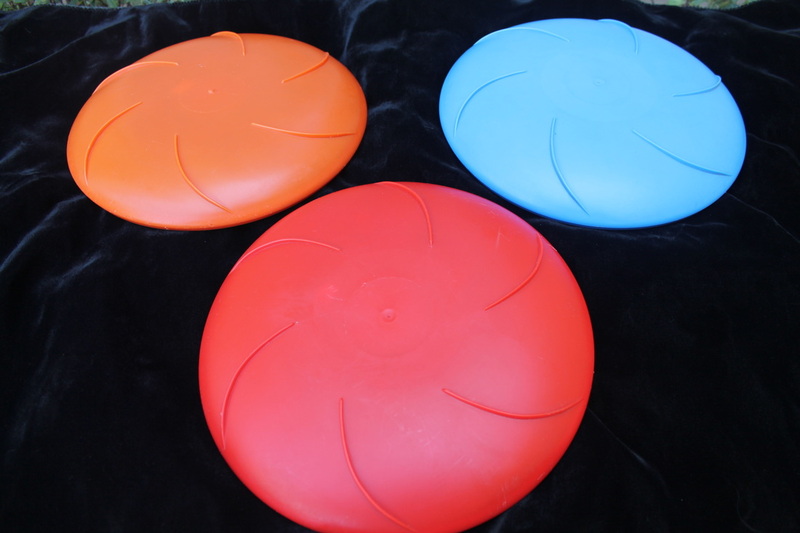 Premier Products Mars Platter 1st style has a esker. 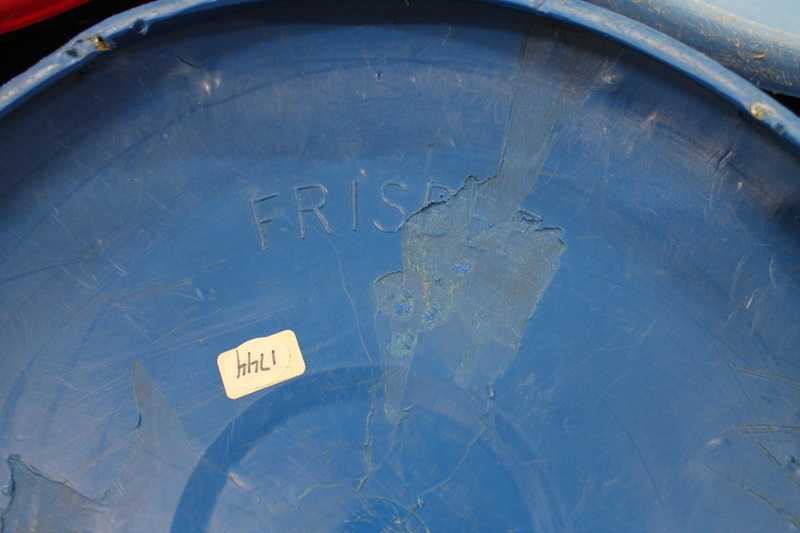 This one is in Good- condition, value at $135. 3rd run Premier Products. Good+ condition value $160. 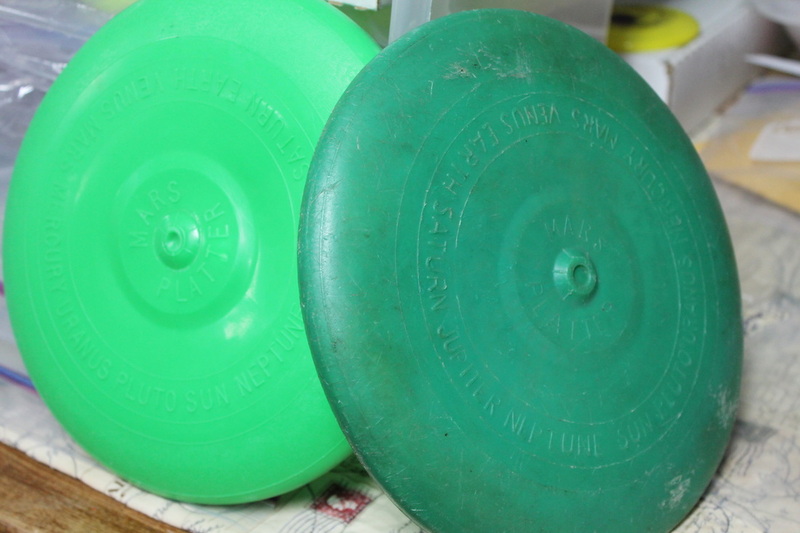 2 different color green Premier Products. New condition 1st run value $300, Good+ condition 3rd run value on right $160. 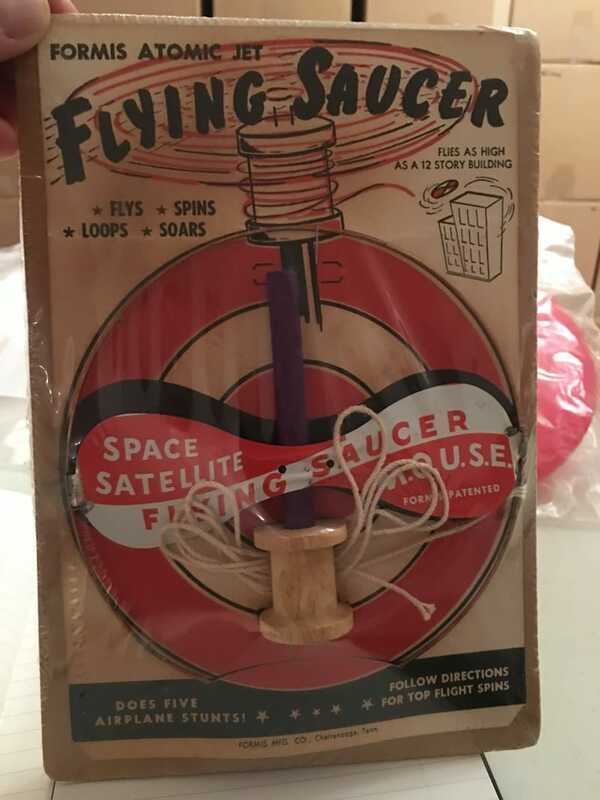 The FS1,2 & 3 are interesting because the plastic is always evolving & changing, when first made they were all flat, all of mine had a mountain or point to them. 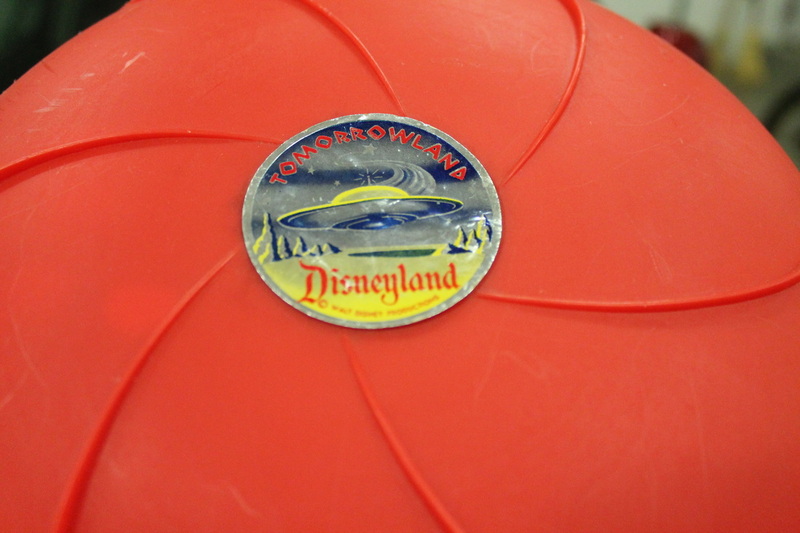 I got this one because the plastic has shifted the opposite way more of a volcano look. 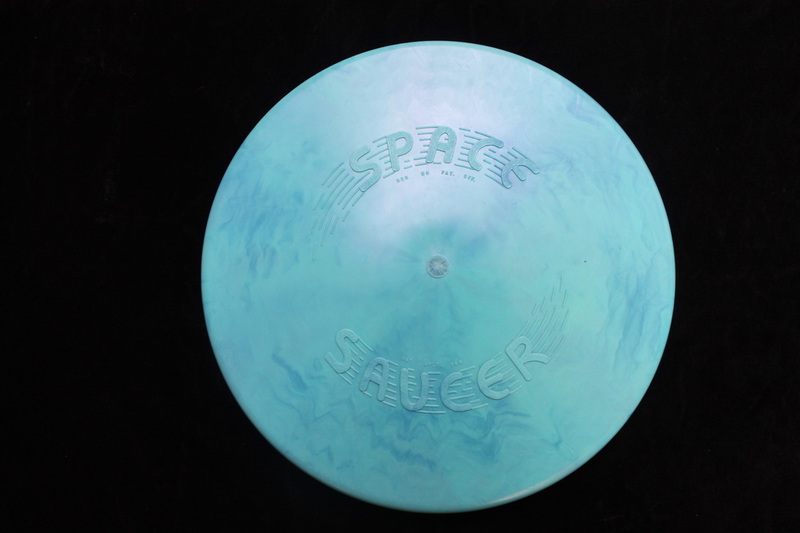 Different look at above disc. 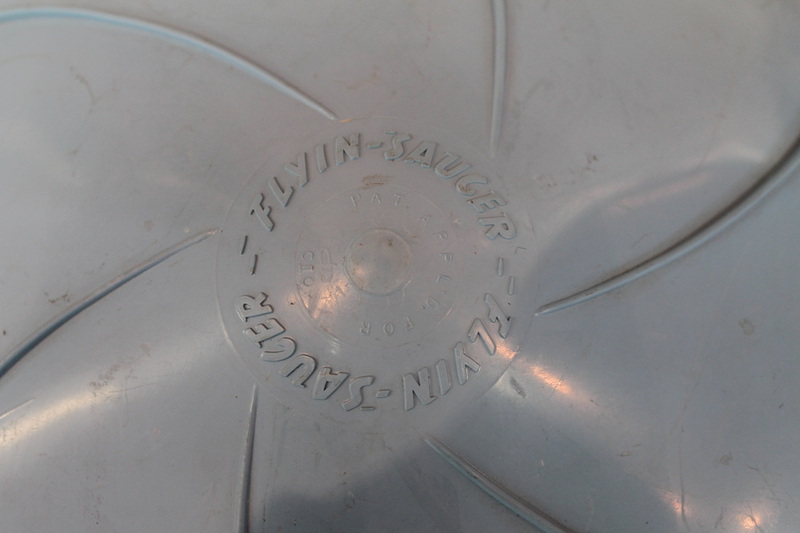 Liflik Products Magic Saucer Back to Back disc made of ping pong ball material, Arcuate Vanes on the underside, 6 port holes with door decal, made in the 60s. Value $175 each. 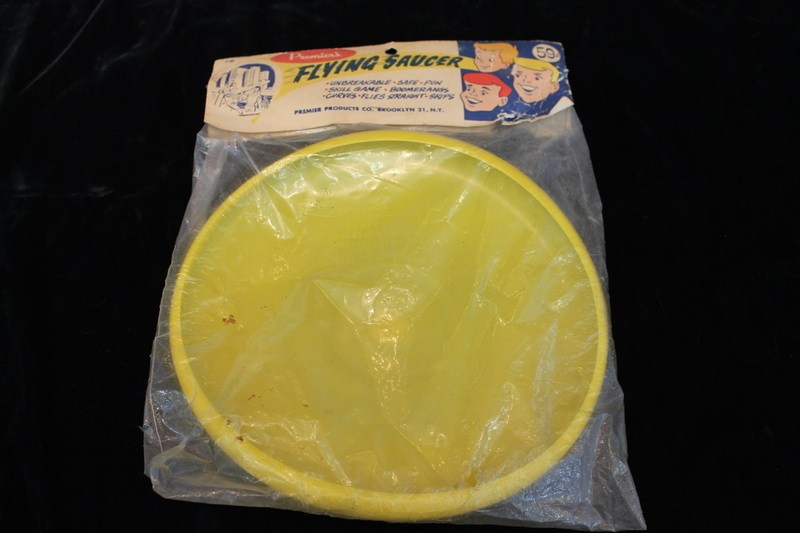 Hall ( Circa 1949 ) Sky Pie, came with a wire catcher, I had the mold for this flying ring but took it apart and sold the top and bottom plates as well as the ejector pins to Kory Stone, Kory made a shadow box with some nice different colored rings. 1st period was of a soft plastic, 2nd period was of a stiff plastic, value $200 each. 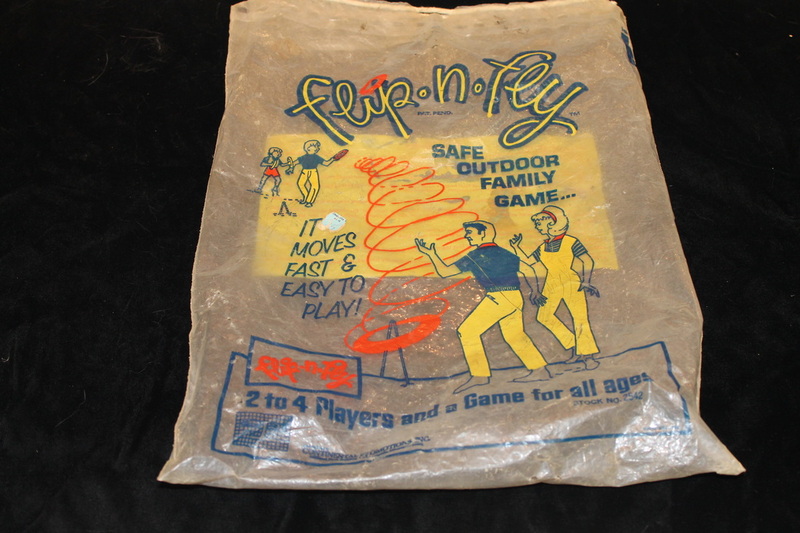 Continental Promotions inc, Flip & Fly, value $100. Empire Plastics Zo-lar in the package! Value $775. 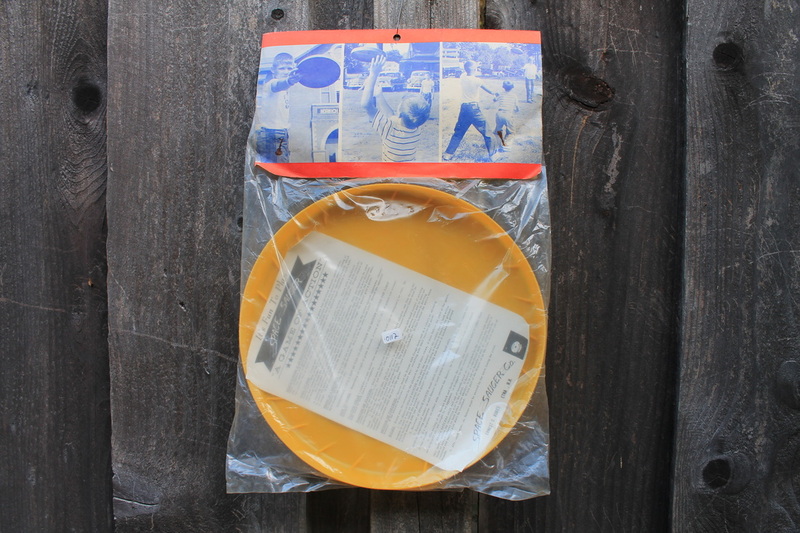 Empire Plastics Zo-lar this silk screen is the first disc decorated with a hot stamp / silk screen , rare! New condition value $500. Try & find one of these with out a warp! Value $180.with card. 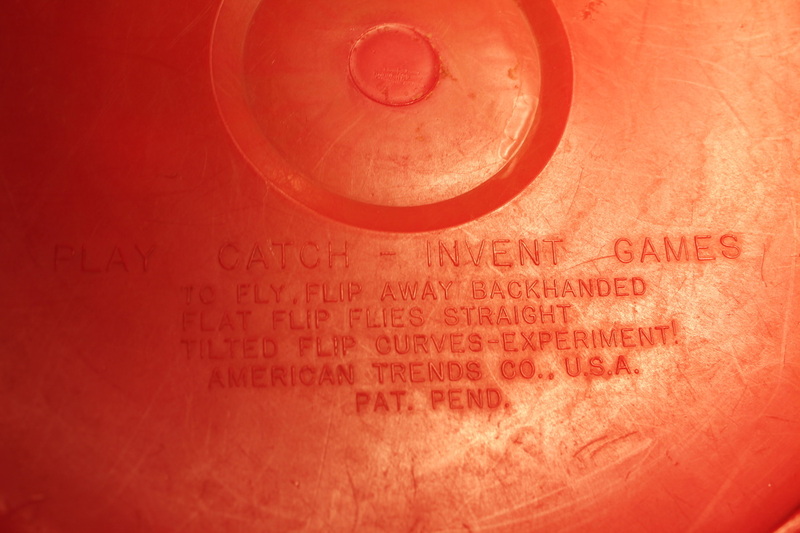 Underside of above 39 cent insert. Looks like the game of guts to me! 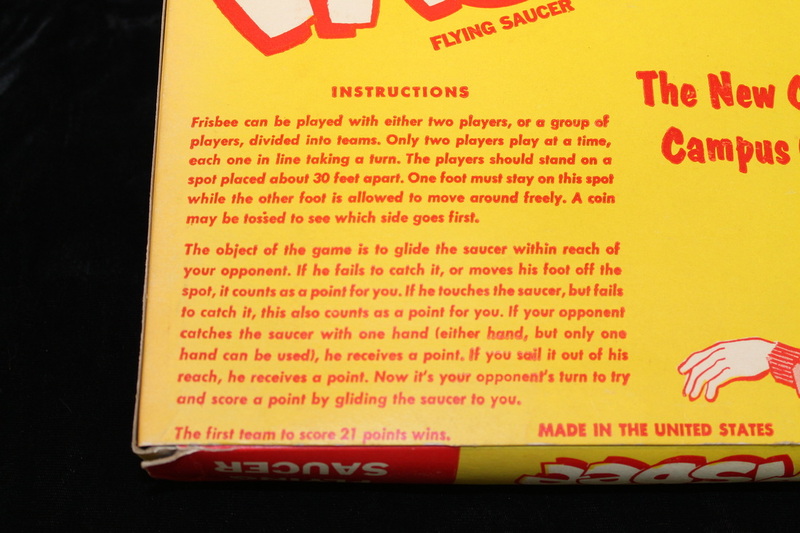 Empire Plastics Regular Mystery 'Y' 2 players one with a Y on the shirt, underside has game instructions. below is the larger Giant Mystery 'Y' they also came in a box set. This one is like new condition, value $260. Empire Plastics Regular Mystery "Y". Good + condition value $120. The regular and the giant were made in the late 50s early 60s. Like new with box, $750. 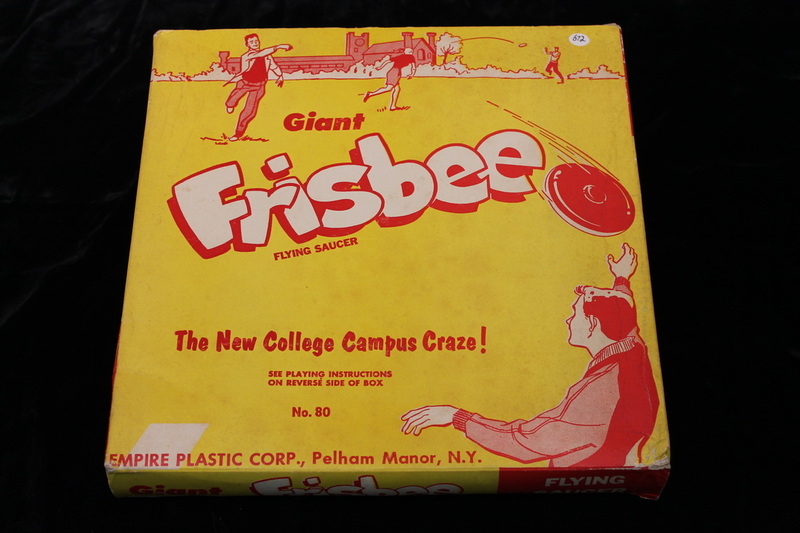 Wham-o took control of Empire Plastics because of the use of the word Frisbee. Later they would produce these discs with a slight retooling adding 4 small lines on the shoulder of the cupola reissue was in 1979. 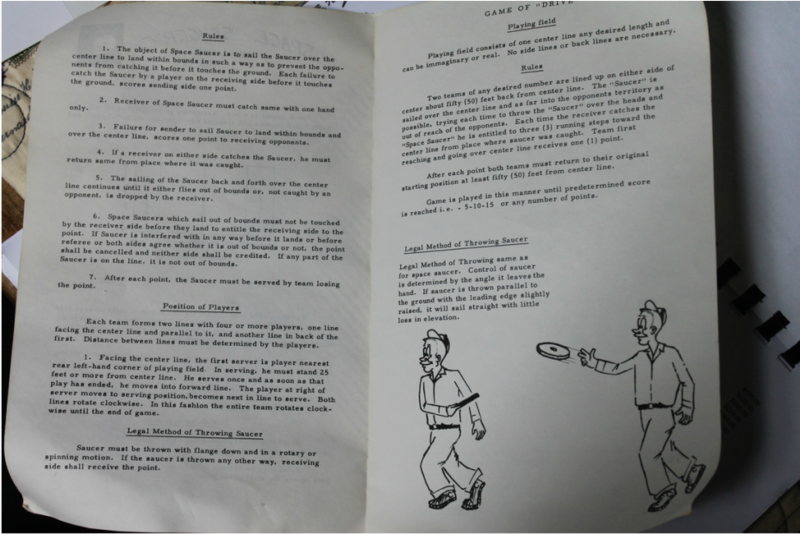 The first rules for the game of guts? 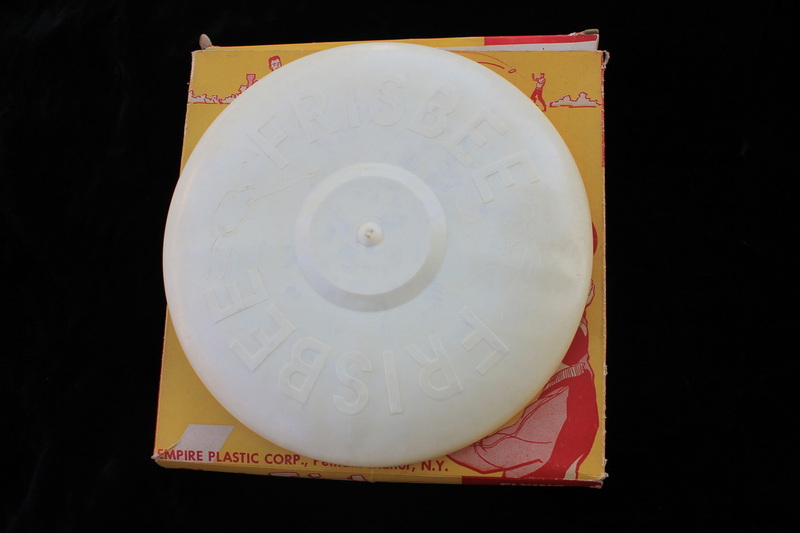 A rare white Giant Mystery " Y " from Empire Plastic corp. Value $825. 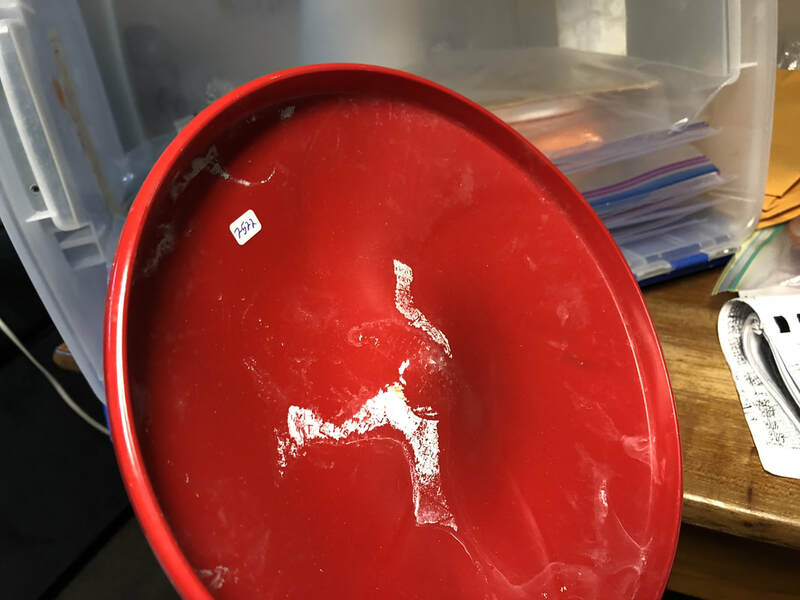 As you can see I have a yellow Empire Plastics Giant Mystery "Y" ( above ) also a white that I got from Charlie Burke, some people think the white is a Wham-o, below is a white in a Wham-o package. I wanted to put the 2 white side by side to show a difference in the color, above the disc seems more white than it really is, side by side you can see that the disc on the left is more yellow in color. Could be from the start of the run or the end of the run. Donn Blake thinks they are from different runs, none have the Wham-o 4 nicks on the cupola. Some collectors say Empire plastics never did a white run, thinking out loud Wham-o did a test run then retooled the mold? 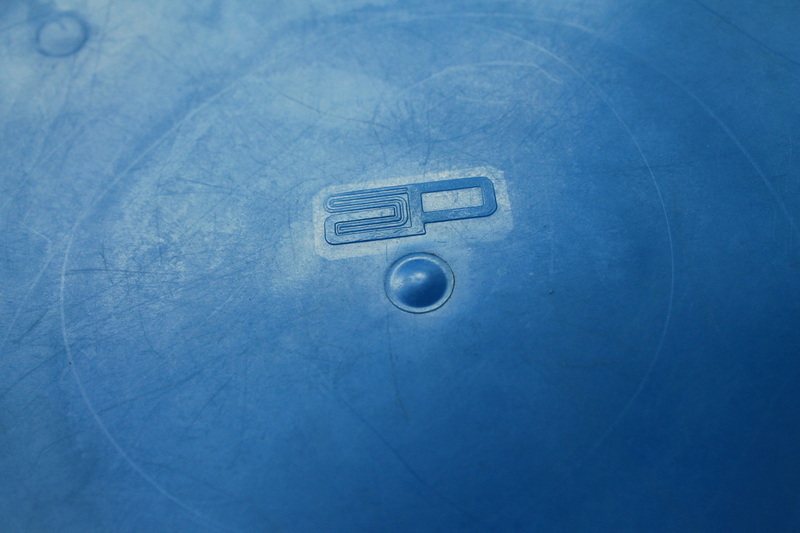 Donn also pointed out a small difference on the ejector pin area on top of the disc. 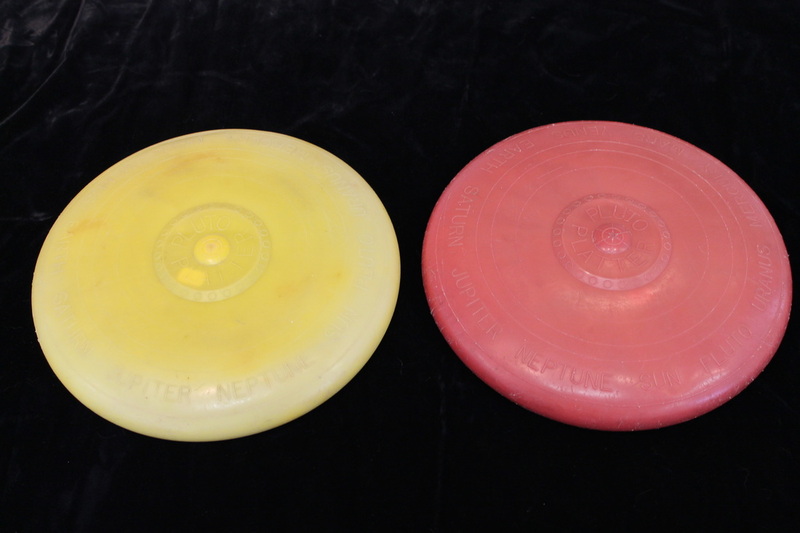 Donn thinks this disc on the left is a Empire Plastics disc as does Charlie, not sure how to clear this up but there are a few different ideas. To see My Giant with the Wham-o nicks look under Wham-o. Wham-o test run before the nicks on the cupola, in a Pro package, disc looks to big to me! New condition with a crack still has a $700 value in my book! Ernest Robes 1954 prototype, there were 4 or 5 different hand stamped prototype made, value $700. Ernest Robes Space Saucer 2nd generation 5th period. 1957-1959. Value $160. Ernest Robes Space Saucer 2nd generation 5th period. 1957-1959. Value $235. 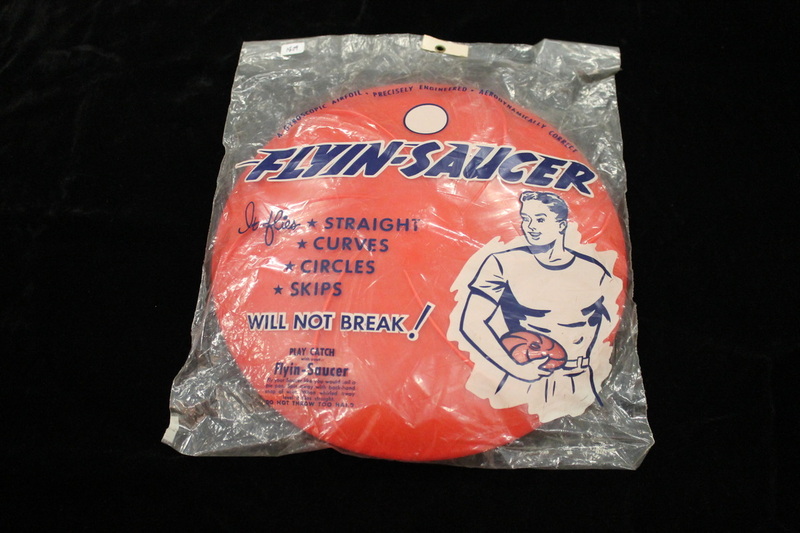 Ernest Robes Space Saucer 2nd generation 5th period. 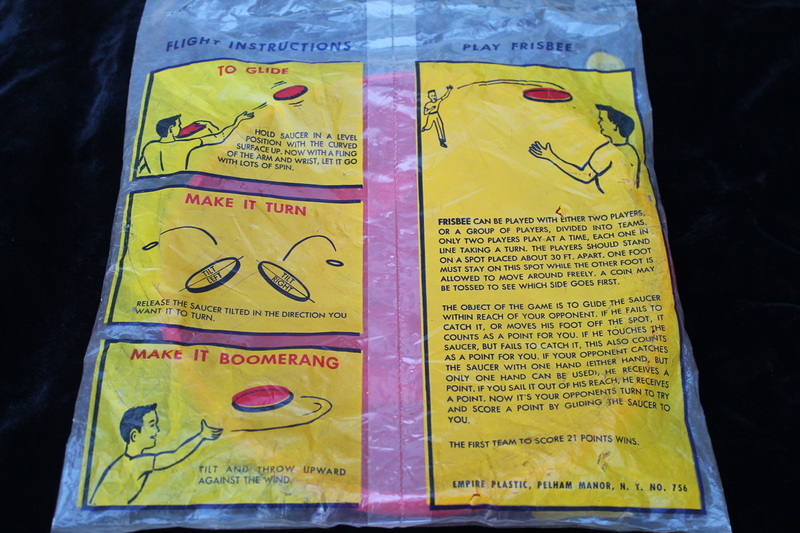 1957-1959, found this one in a kite store in Hawaii years ago. Value $235. 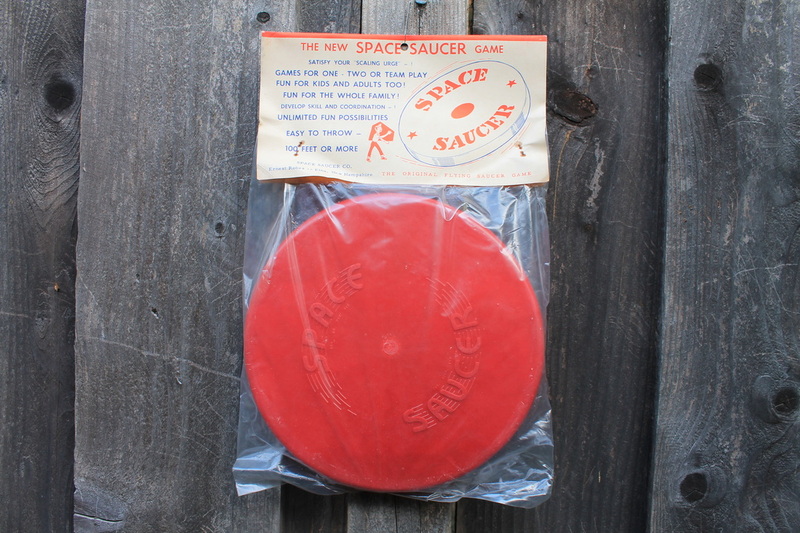 Ernest Rolbes Space Saucer 2nd generation 5th period, this one came with s different insert. see below. Value $240. 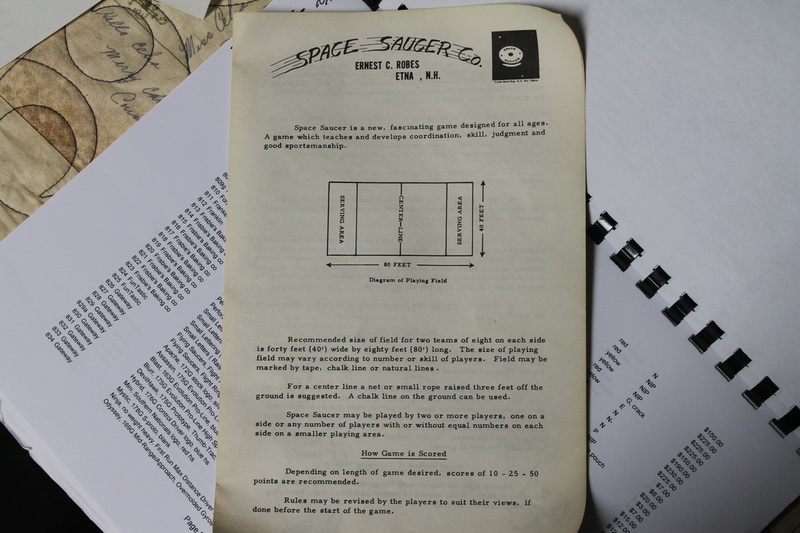 Common insert found in the Space Saucer packaging. 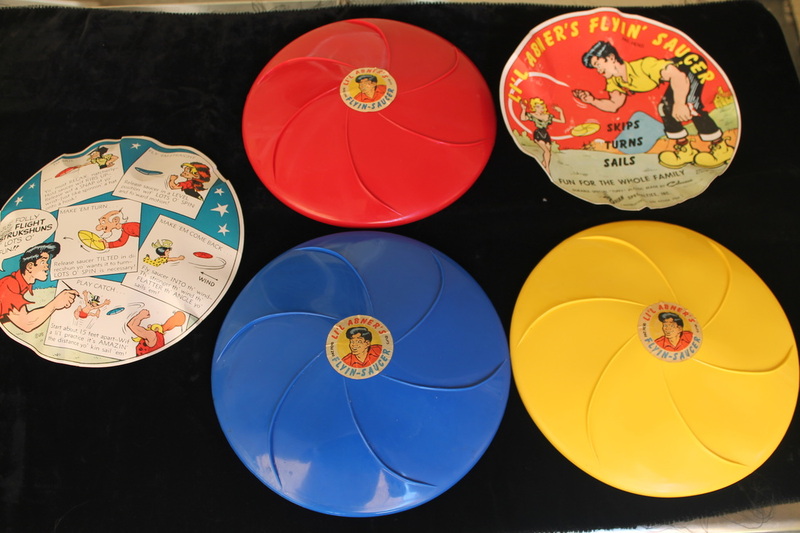 Transogram Co FRISBEE JR. Fastback design small 5" discs, 3 in pack circa 1958.
second set has 5 minis! Value $700 each. Set on left is now in the collection of Phil Kennedy. 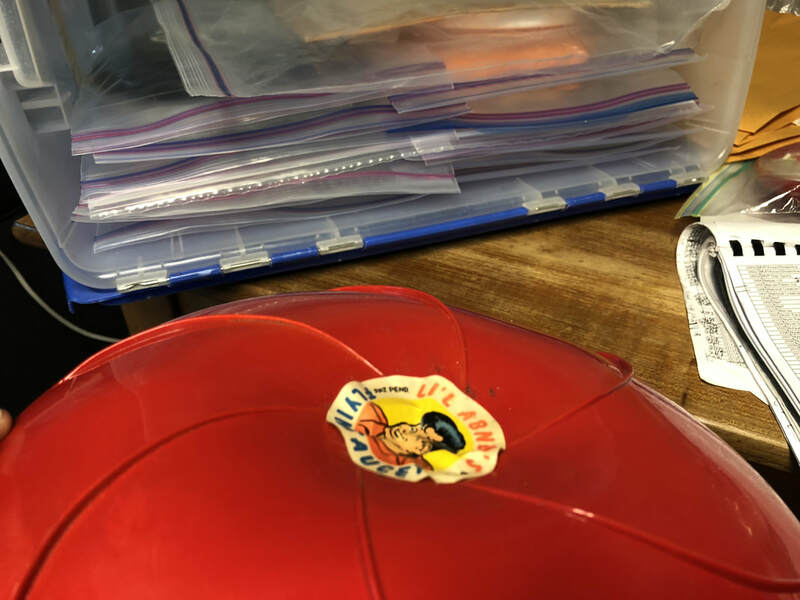 Empire Plastics Mystery "Y" regular in a Wham-o package. The man who started it all! 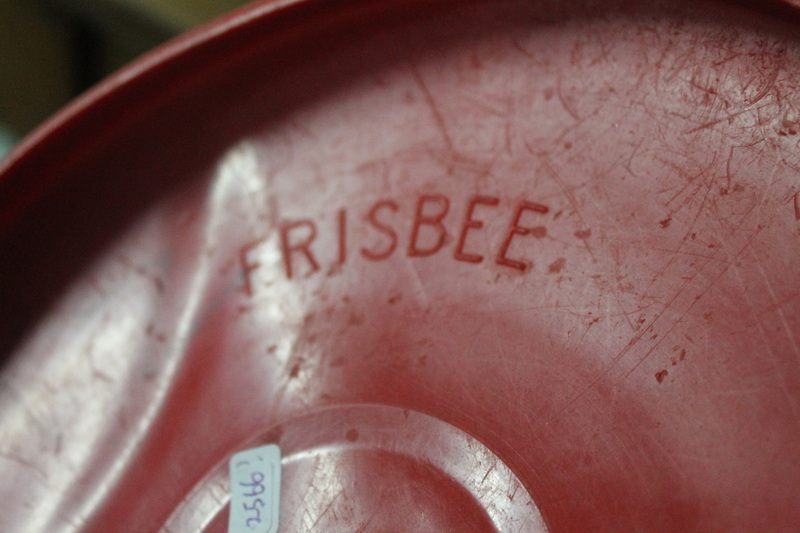 Backside of above disc, Value $450. 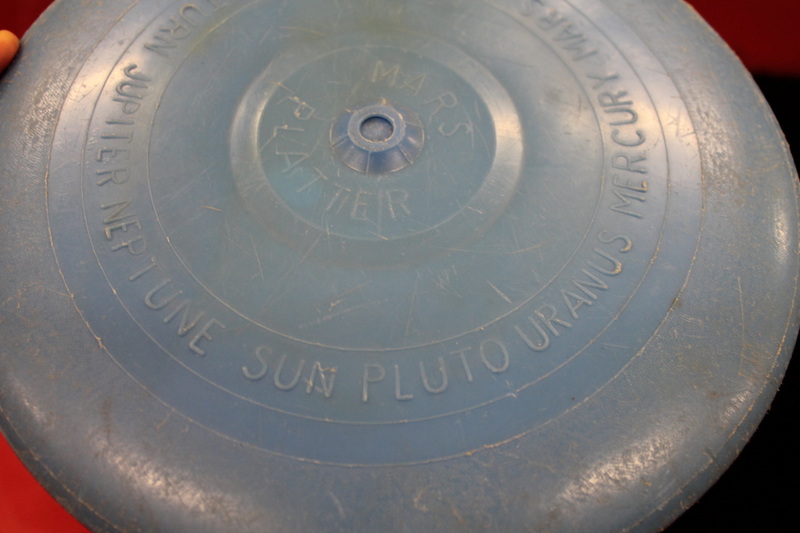 Premier Products Mars Platter ( pre Wham-o ) Planets, Stippled rim 2nd style, Planets in order, there were 3 runs of these discs, first had the planets out of order, second had them in order and last you find the word Frisbee on the underside, Wham-o sued and put them out of business and started using the molds. 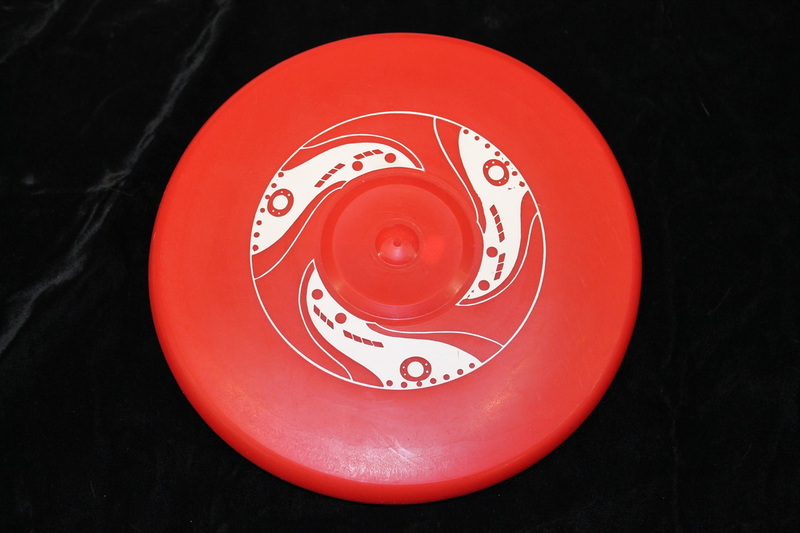 You can find Wham-o Mars Platters with flight rings and stippled rims. 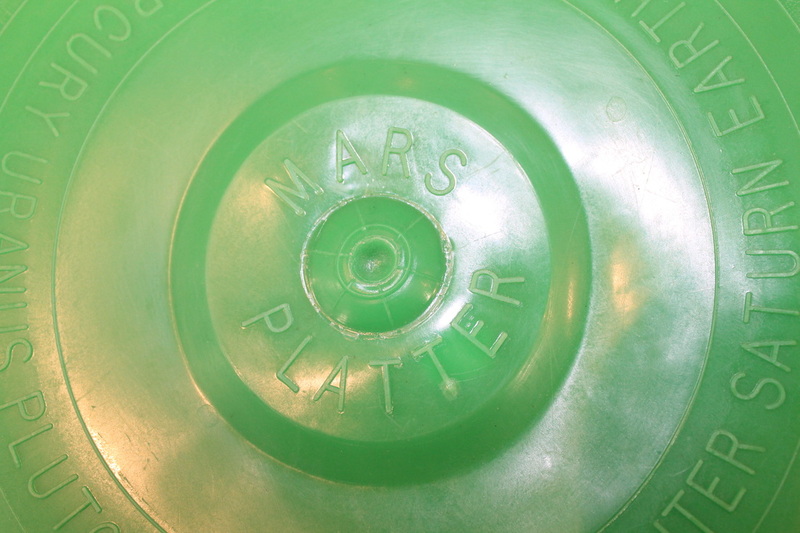 Underside of the Mars Platter. This one is now in the collection of John Kirkland. 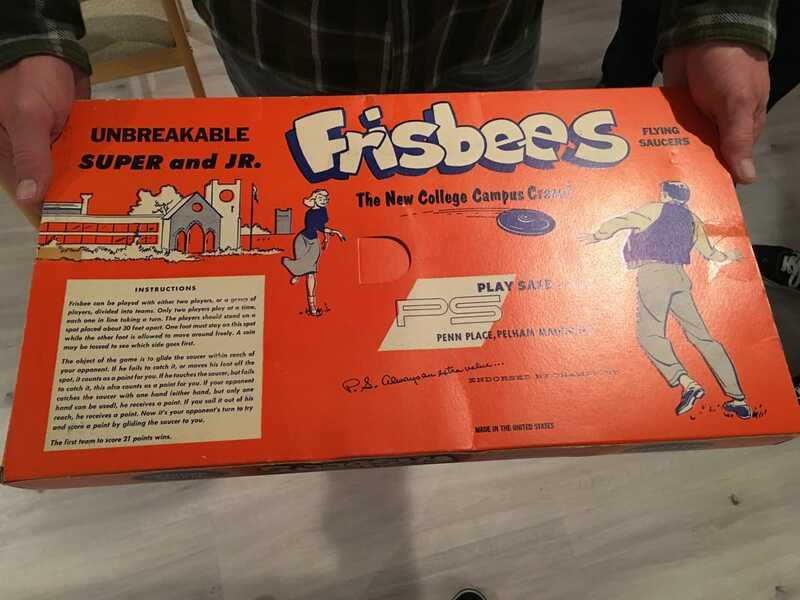 Got this from Ralph, you can see it is in bad shape, he had glued it back together after a bad break, Once again it is in poor condition, but you see how he loved his discs! 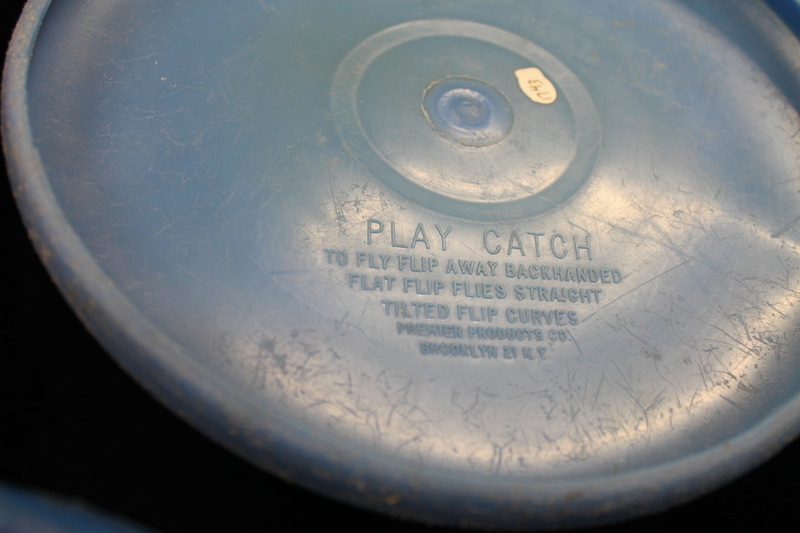 Note goes with above disc. another Premier Products Mars Platter 2nd style. Value $675. 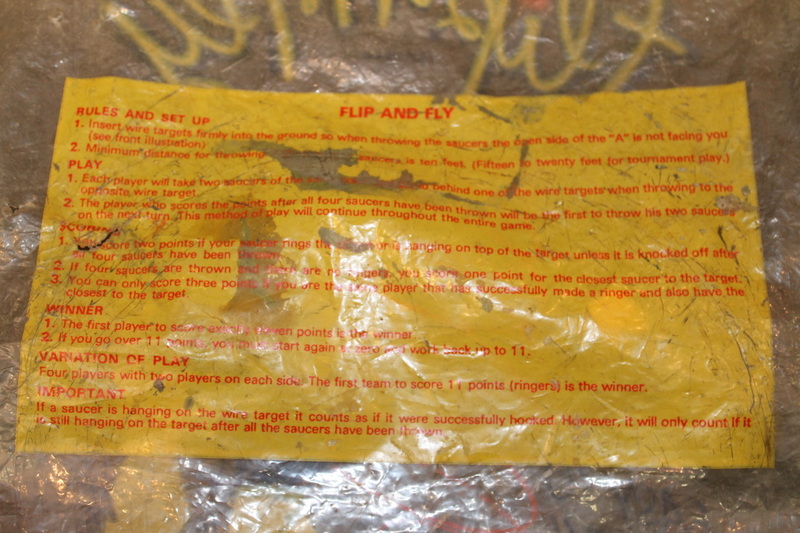 you can see the script through the bag. 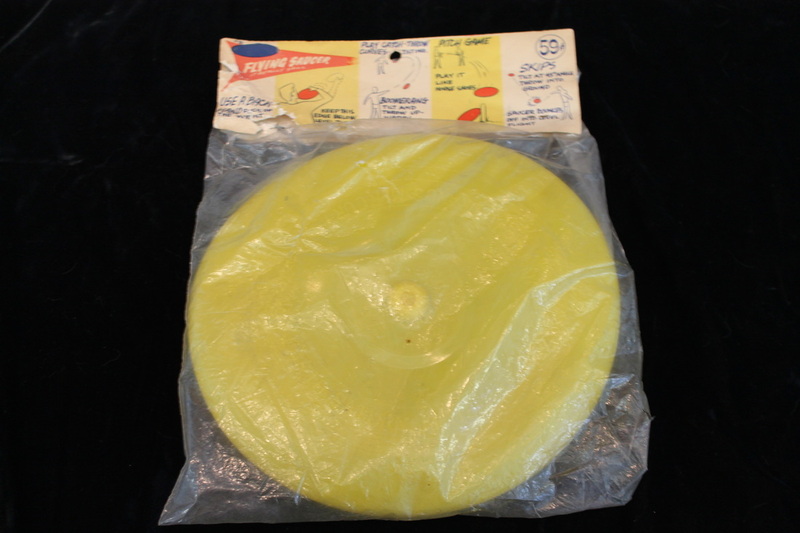 Plastic Pipe Fittings PFI Flying Saucer Dearborn Michigan, 1960s, Good- condition Value $275. 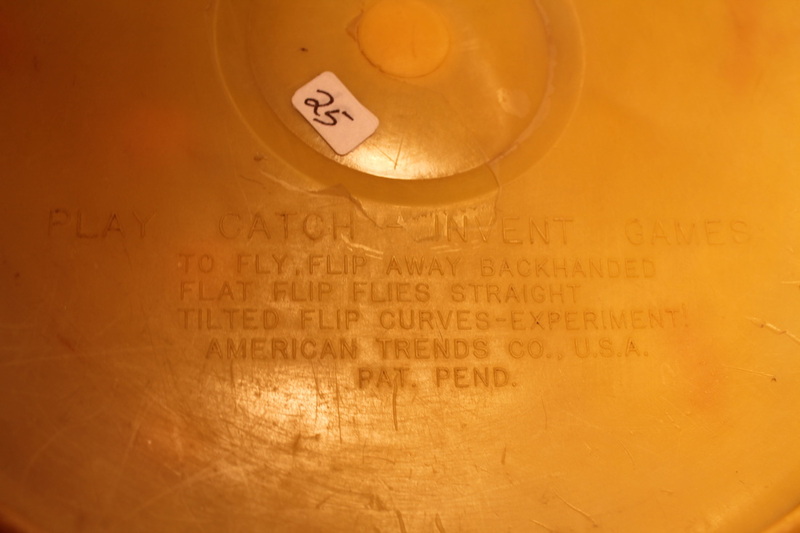 On the underside of above disc, It is how I got it from Ralph. 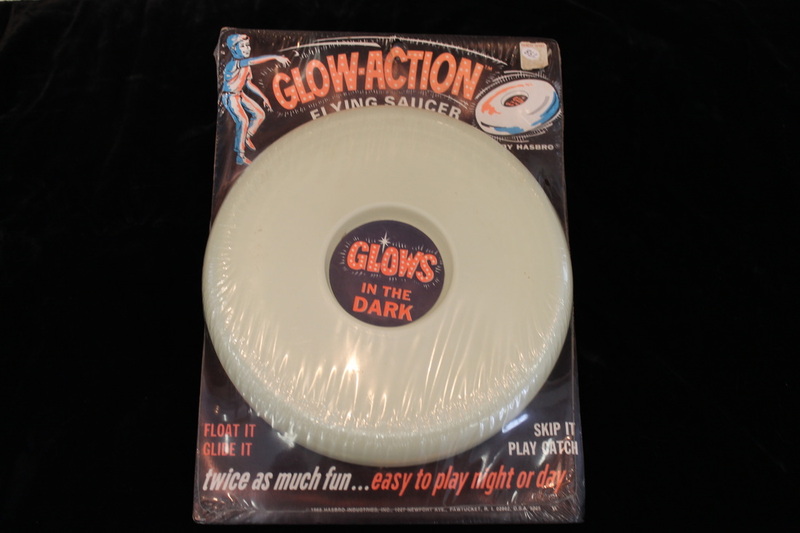 1968 Hasbro, Hasbro glow, Glows in the dark label. Value $140. 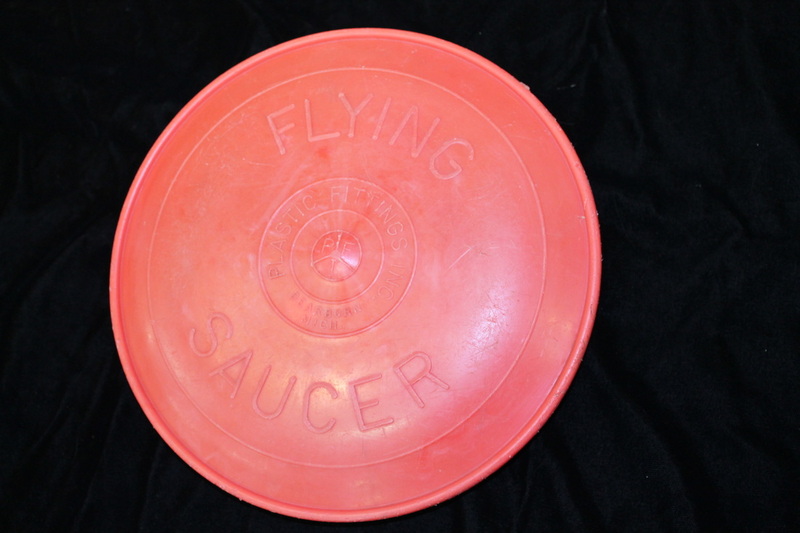 Auburn Rubber Co. HOLY TOLEDO Aka-Atlantis, large cupola 1 flight ring. 1964, Value $225 each. A few other colors of the Holy Toledo! Premier Products Mars Platter ( pre Wham-o ), Planets, Esker, Stippled Rim 1st run Planets out of order. Like new $300 value. 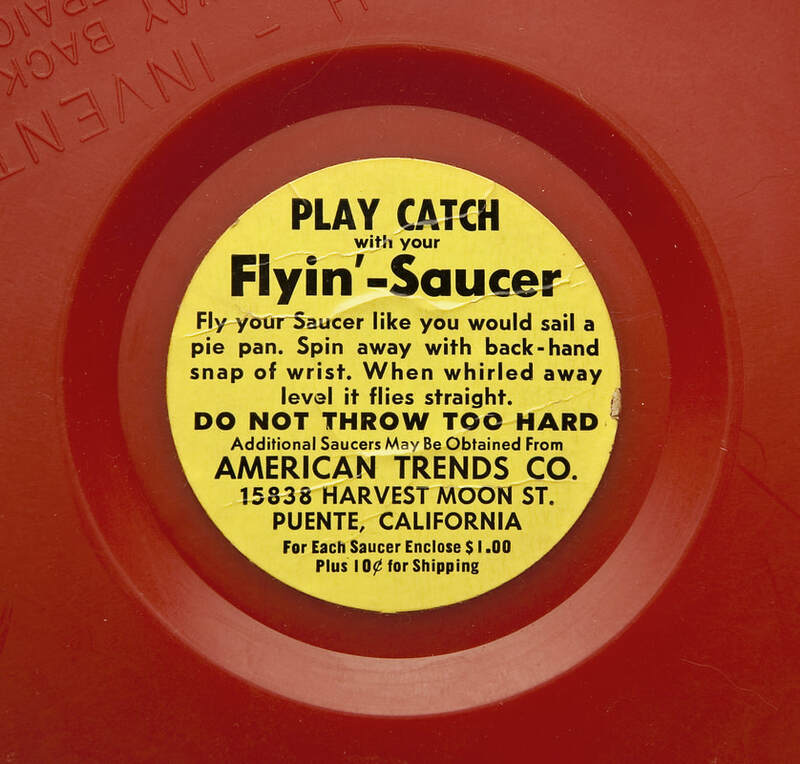 Pipco ( 1948 ) FS1 Flyin-Saucer, 1st style, one of the colors ( Black would be the other ) of the first run of the first ever plastic flying disc. this one is powder blue. One of my favorite! Value $3,000. Hard to find is a understatement! 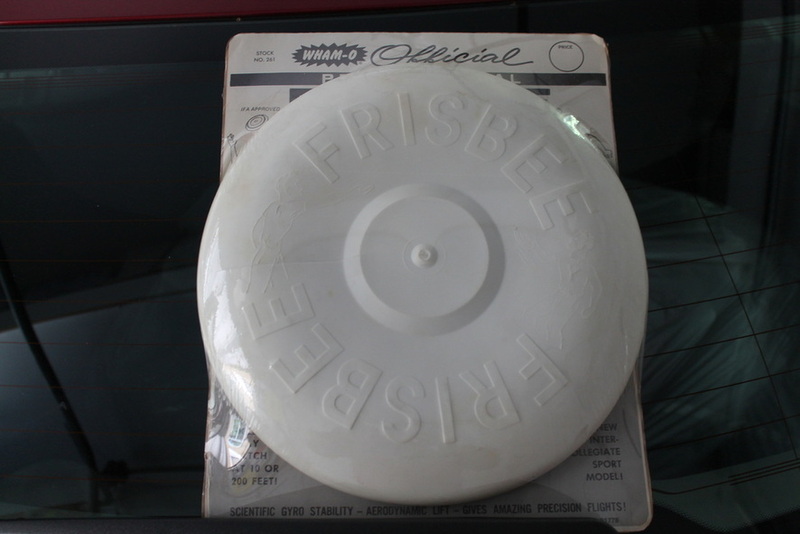 Abel Enterprises Jupiter ll, "back to back" disc made of "ping pong ball" material with star of David on the underside. Value $275. 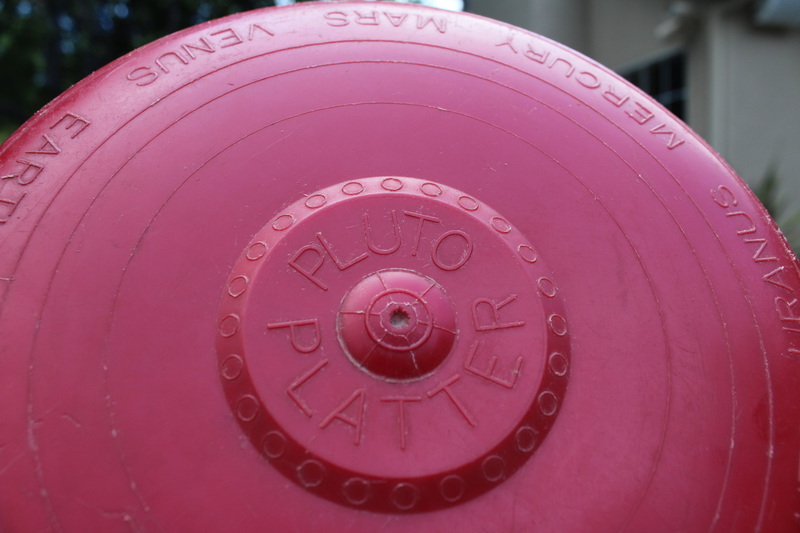 American Trends Pluto Platters 1955-1956 before Wham-o's mass production. Thanks Fred! Both in Good condition, value $3,000 each. yep a few dog teeth marks. 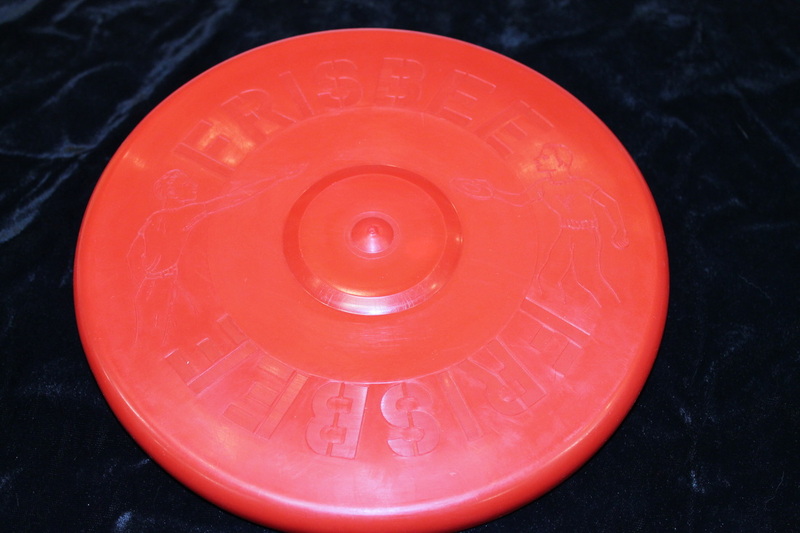 Got this disc from 8 X Freestyle champ Joe Messner, He got it for a city official for pulling disc sports in his area of Marina California, at the time Joe wanted to sell most of his plastic, I had to have this disc so I loaded up my Suburban to the gills & spent the next year selling Joes stuff! Thats right 2 of them! With the help of a stranger and new friend Brad I have 2 of these reorder cards, one for each of my ATPP. Very rare, only 4 known to collectors. 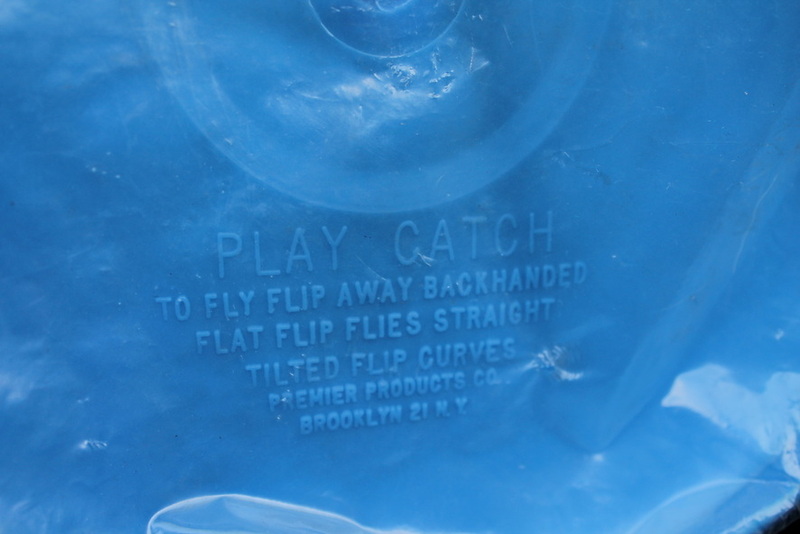 They also made the disc in blue not listed on the form. value $ 500. 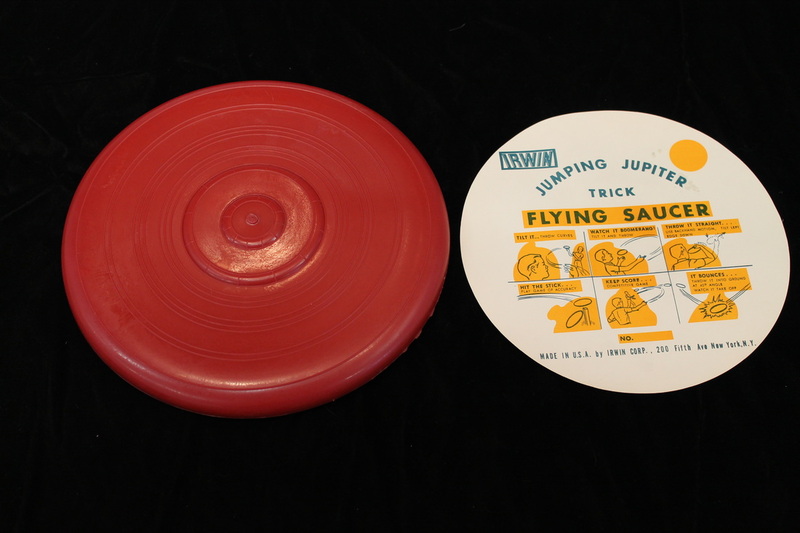 The Irwin Jumping Jupiter was a tuff disc to find. 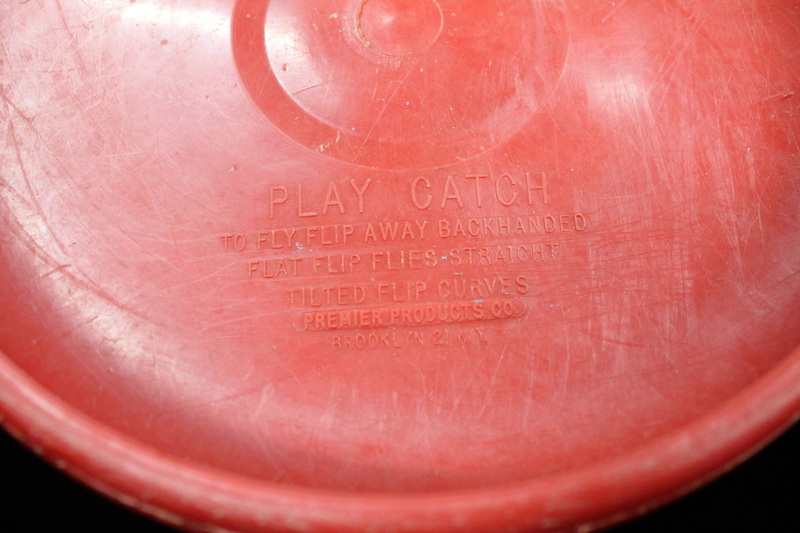 There are no markings to ID the disc. This one came with a insert. Before I got this disc I had only seen these in photos! I have the bag it came in & you see the insert, Value $550. 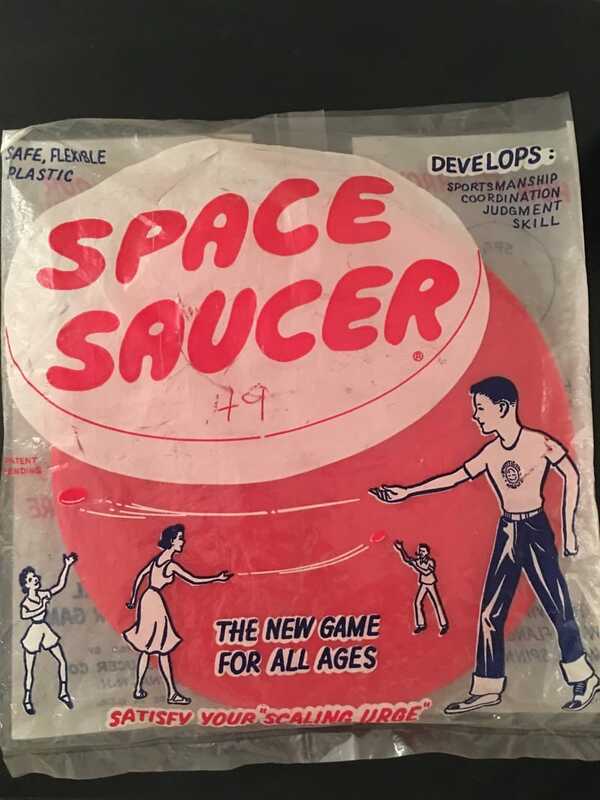 From a private collection, All but one of my Space Saucers ( one being a prototype ) are the same run, bottom left in this picture is a package I do not have & guessing a different run as well, this is on my wish list! 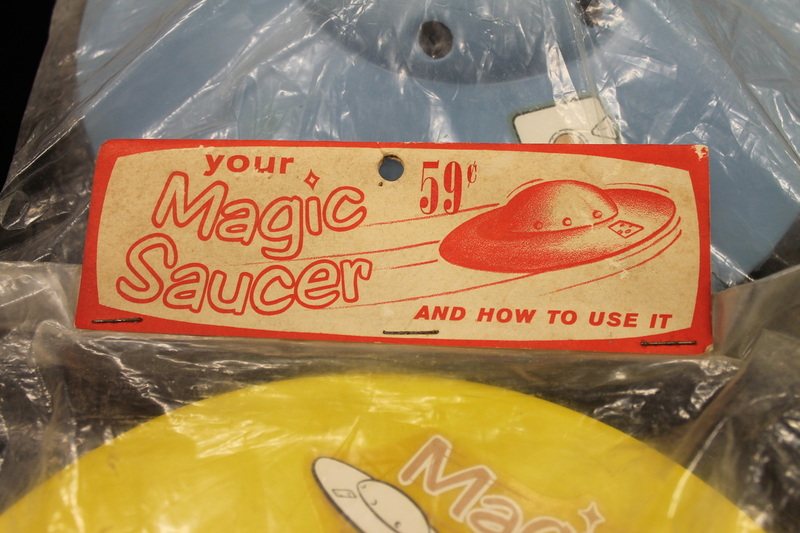 From a private collection, a bunch of Space Saucers but what is on my wish list is the IT came from outer space, top right. From a private collection, on my wish list is the 2 disc box set from Empire Plastics! From a private collection. Value $3.000. from a private collection. 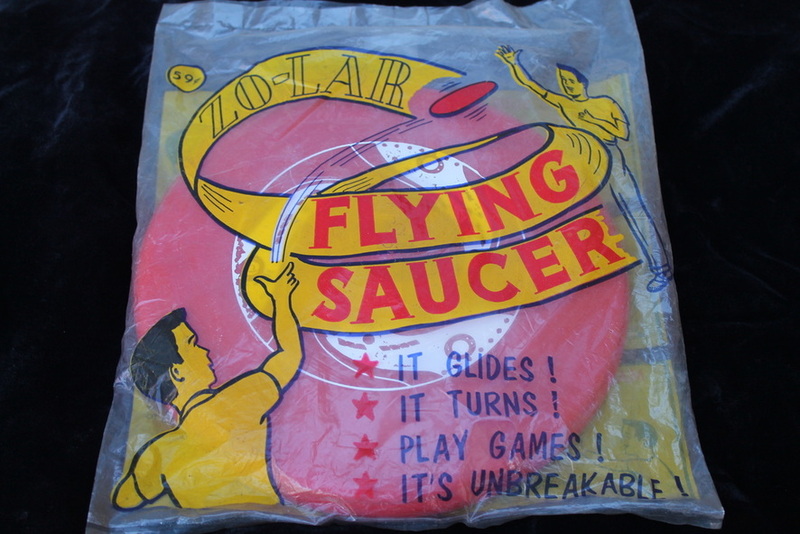 Value $1000, this one is funny, I saw it in Victors book & I always chased it because I did not have it, No one ever talked about it much, come to find out that it dates back to one of the earliest flying discs! 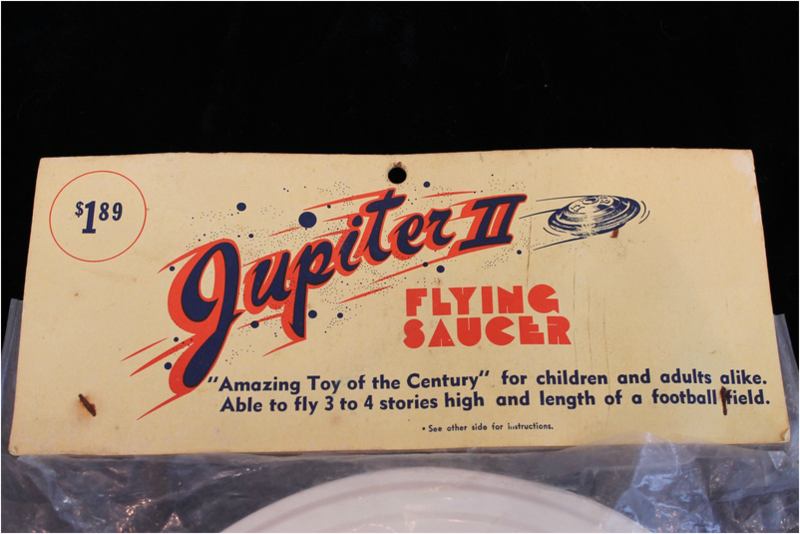 Flying- Saucer was first in 1948, Not a disc but a ring the Sky-Pie was from 1949, The Space Saucer shows up along with the AT Pluto Platter in the mid 50s as does this disc, now you know, I had the mold for the Sky -Pie, got it from Ralph Williamson, You know him? 10 X Disc Golf World Champion not in the Hall Of Fame. Anyway, it was a 500 lbs paper weight, you can see a picture of my boy Curtis helping me take it apart, WE got the top & bottom plates among with the push pins & traded them to Kory Stone, Kory did a display box with them, I need to contact him for a photo, to see the picture of Curtis look under other things!. 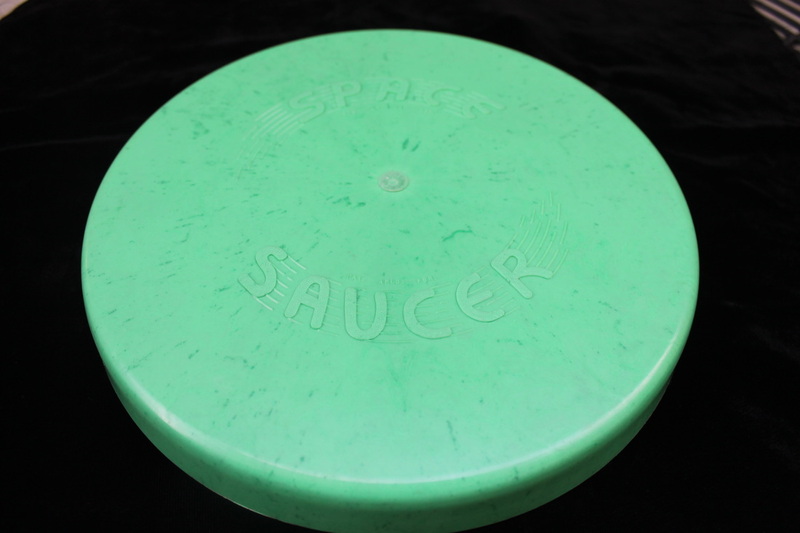 Hard to find run of Space Saucer, from a private collection. Value $750. 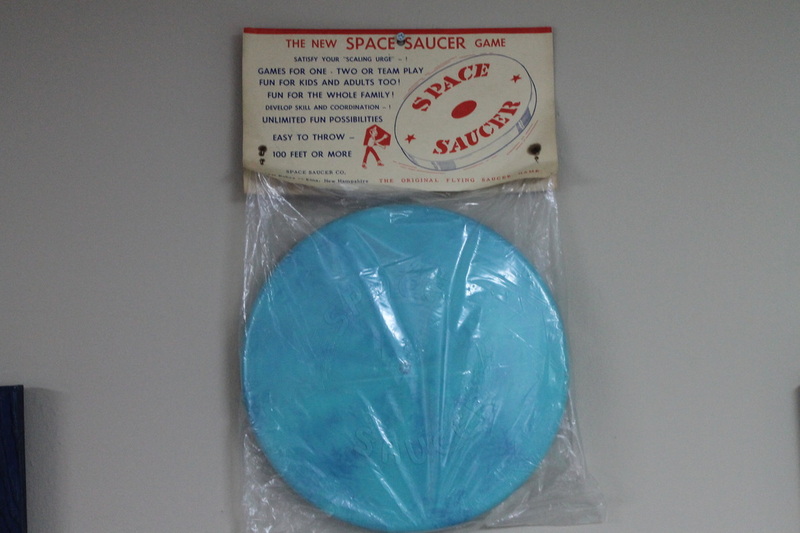 Hard to find Space Saucer package.From a private collection.Value $1,000.